Do you know what a great resume title looks like? Get some of the best resume title suggestions here and check out our examples of interesting resume titles… and crummy resume titles, too! How a Good Objective Statement Can Help You Get an Interview? The ultimate guide to writing resume objectives! This article provides 15 top resume objective examples to help you craft the very best one to assist in your job search. Don’t miss it! What is a resume objective? What should you write to draw attention to your career objectives, your job target, and your key skills? Follow this link for smart ideas to get you started. Ever wonder how to write a career objective? 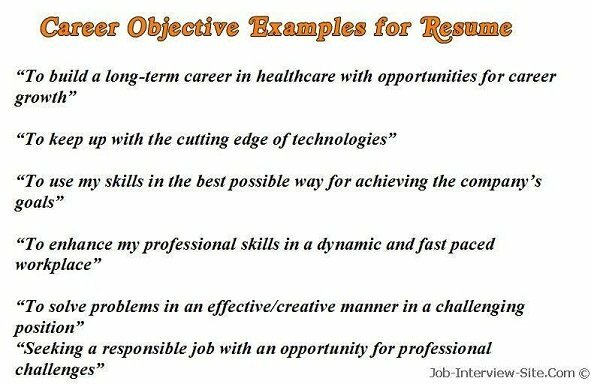 This article explains how to write career objectives and provides free career objectives examples that you can personalize for your own resume. How can a great career mission statement project your focused approach to your professional life? Find out why you should be designing incredible career goal statements in this article. 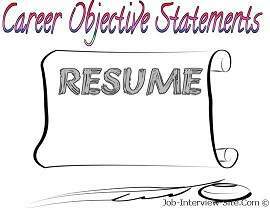 Should you use a career objective statement on your resume? Find out more details for well-written resume career objective statement, examples, and tips packed into this article! We’ve rounded up a wide variety of top tips for writing an effective resume objective statement and what you want your statement to project. The article also provides a free example. Don’t miss this article with examples of 5 common phrases you can edit and personalize according to your needs. Get ready to learn about job targets and what you will bring to the position. Which main aspects should you showcase in a resume object when applying for a sales position? Check out his article when applying to be a sales representative, associate, manager, etc. Did you know the importance of stating key achievements in resumes? Check out this article for 22 best samples of achievements that can be edited according to own career performance. Did you know that while a properly written resume objective can pull a reader to your resume, a bad one can drive him or her away? See this article for ideas when writing a resume objective. Consider how to write a customer service objective statement – you’ll want to present briefly your experience and your main skills. Take a closer look at this article for some tips and examples. If you are looking for entry level positions, try to keep the career objectives practical and not overly ambitious. Your career objective statement should state that you are looking to join a stable company that would give you a chance to learn and progress.